Who would think you need advice on working at home with BIG kids? I never would have. I thought the challenge was trying to work when your kids need constant tending. When they are in school or old enough to manage most of their own school work, it should be EASY to work at home, right? Well, we ALL learn as we go. I was swimming along nicely doing contract work for a non-profit. They were very willing to be flexible with me, allowing me to adjust my schedule and understanding that I had kids at home and was homeschooling. I did a little travelling, attended meetings and trainings and did most of my work from my house. It was ideal! And yet, I found myself struggling to do the best work I knew I could offer. I found myself unable to easily take meetings or make calls. I hesitated to commit to travel or events. My kids had gotten busier and I, as primary chauffeur, needed to keep up. Then my oldest started school and the commute (which in my case wasn’t even every day, thanks to some carpooling) completely cut into my afternoon work time. Because I was still homeschooling two others, losing this afternoon time hit me hard. It was then that I realized I needed to admit the fit was no longer right. Not everyone will feel the same as their kids get older. But for me, I found the increase in extracurricular activities overall caused a huge shift in my time management and allocation. Though I did much work after hours, enough of the job involved activity during typical business hours for me to feel the impact. That’s when I began to consider alternatives with much more flexibility or that would fit my kids’ school schedules. This blog and teaching for VIPKid are what fit for this season of my life and I’m fortunate for those options. 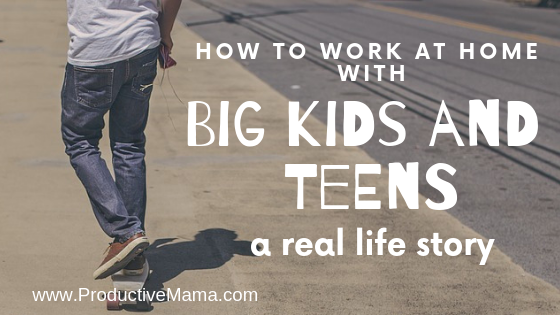 When our kids move into the teen years they do often exhibit more independence and maturity. In that way it’s certainly easier to work at home as they grow. But sometimes they also struggle with bigger issues that require parental presence when they’re home with you. Bigger kids do have bigger problems, even if in many ways they are now more self-sufficient. These days teenagers are under way more stress than previous generations. Knowing that a parent is emotionally available to them can really alleviate some of their stress. As we begin in consider colleges and futures beyond this household, I also know my time to be available in this way is dwindling. They sense it, too. They know life is about to change in a big way and vacillate between experimenting with adulthood and childhood. It’s tricky for all of us! Now that my girls are older, I also know they will remember what I model for them. It’s still valuable to me that they see that our family works together as a team. My role may not be primary breadwinner, but my role is still important. And when I’ve made changes, I can talk to them about why. When I’ve worked more, we discussed why I decided this was the best decision and how it would impact them (both positively and negatively). And when I’ve worked less, I’ve discussed the same. And through that I’ve shown them that in my primary role as mom I am always trying to balance what is best for me and the family, being creative and flexible when needed. We are also modeling that money isn’t the only factor. We have deliberately chosen to go without things so that we can HAVE some things that money cannot buy. Involve your kids in your business. Hire them. Or just ask them to help because it helps the family. They can file, offer tech help, run errands, seal and stamp mailings, answer the phone and more. Be sure your kids are cooking some meals and doing some household jobs so that you can focus on work. If you’ve been working with them over the years they are certainly ready to prepare and clean up after meals. Or clean bathrooms or take over the laundry, freeing up hours for you to work. Take over basic home administrative tasks, like some correspondence and bill paying. I sometimes have my kids write checks and fill out forms for me to sign. Watch younger children, even doing some school work with them. In short: what tasks can THEY do so that you can work? I know not everyone is lucky enough to be able to choose whether or not or how much to work (either at home or outside the home). I hope I have not come off as privileged or ungrateful. My intent is simply to share my work-at-home journey and the changes having older kids brought to that journey for others who find themselves in similar positions.